Excerpted from the July/August 2015 issue of Christian Woman Magazine. There is much talk today in churches and in Christian literature about being relevant. Congregations tweak their service times and worship order to be relevant to people’s needs. Some have introduced different music styles while others have traded sound biblical teaching for entertainment. Many young people have dropped out of the church altogether because they say that it is not relevant to their needs and interests. The message often heard today is that we must be accommodating to whatever is happening in society, and this message comes from a variety of sources – pop music, television, celebrity culture, professional sports and even the public school system, including higher education. Nothing, perhaps, has done more to shape public opinion than the Internet. We are told that we must accept homosexuality as an alternate lifestyle and that we must be tolerant of Islam. We are urged to interact with others through social media and to devote our productive time to popular causes, many of them dubious. This desire to relate to whatever is current often encourages ideas and practices that do not follow traditional values. But the cry for relevance has been repeated and modeled so widely that it has become the dictum of Western Culture. When we compare how widespread these various influences are with the amount of time our children spend in Bible class, youth activities, worship services, worthwhile volunteering, and biblical teaching at home, it is easy to see why Christian parents often feel they are fighting an uphill battle. Growing up in Pakistan I went to school and college, and I covered my head with a dupatta because it was the law, not because it was the fashion, although our culture maximized both. Increasingly, it is becoming fashionable in this country to adopt this practice, and often it reflects the desire to relate to a different way of thinking. What is a novelty one day can quickly become a fashion trend when seen as a way to express one’s desire to be relevant. These days, at nearly every speaking engagement I go to, I am introduced to a mother who has a tearful story to share. It involves a child, reared in a Christian home, who has gone astray into Islam because he or she began dating a Muslim. I do the best I can to console these mothers whose sons have become enamored by the beauty and charm of young ladies from Islamic homes and as a result, they have come to question their Christian upbringing. I am equally baffled by the empowered American girl who subjugates herself to wearing a hijab in order to cover her beautiful blonde, brunette or red hair for a man whose intentions may be completely foreign and antipathetic to our Christian values. Much of the media and many celebrities speak of Islam as if it were simply one more benign religion in the diversity of world religions. But after growing up as a Christian in a majority Muslim country, I can tell you from firsthand experience that Islam is anything but benign in its influence. The reasons we might list for why a growing number of our youth are being influenced by Islam are too numerous to discuss in a single article. Some are beyond a single family’s ability to change. But there is one fundamentally important reason that I see from the perspective of a Christian who grew up in a predominantly Muslim culture. I believe the primary reason why some American teens are turning to Islam is because Islamic teens know more about their Koran than Christian teens know about their Bibles. I realize this is a harsh criticism, but consider the facts. The typical Muslim child is required by a certain age to recite much of the Koran, and as soon as they can read they begin learning the Koran in schools. In the secular nations of the West, it is preferred that no religion be taught to school children. As Christians we would prefer that the government not be in charge of religious teachings. However, in Islamic nations religious training makes up much of the curriculum. In many parts of the Islamic world, young people and children have certain hours of every day set aside just for memorization of the surahs, or sections, of the Koran. So, as I talk to women at nearly every speaking engagement I have, I say this first and foremost: Do not trade the truth of the Bible for the relevance of culture. If you are not involved in a church where the Bible is upheld as God’s infallible truth, get your family into a congregation that teaches the preeminence of the Bible over cultural relevance. Choose a church family where the youth minister is a Bible teacher rather than a highly paid sitter and event planner, and do not saddle the responsibility of your child’s soul on the youth minister under any circumstances. Deuteronomy 6:4-9 should serve the Christian household as well as it served the households of the Israelites to whom it was written. After commanding the people to love God with all their hearts, souls and minds, Moses further commanded that God’s Word be in their hearts. To accomplish this, Israelite parents were to diligently teach the Scriptures to their children and to make them a part of their everyday conversations, nighttime rituals and breakfast discussions. Moses commanded them to wear the words and to display them in their homes and on their gates. If we truly believe that the Bible is God’s Word, as 2 Timothy 3:16-17 affirms, why not teach our children to love it and encourage them to read it for themselves? Why not spend more of our family time talking about living according to the teachings of the Bible? Without question, a battle for the mind is taking place in the world. In Ephesians 6 Paul described it as spiritual warfare that requires a good offensive strategy. Hebrews 4:12-13 informs us that the most powerful weapon in the world is God’s Word. It is “sharper than any two-edged sword” (nkjv)and more effective than bombs or boots on the ground. The gospel has the power to reach the human heart, and we will do more to influence our Muslim neighbors by loving their souls enough to share the gospel with them than we can through any other means. More important for us as Christian parents is the fact that the Bible is the best resource possible for keeping our own children faithful. We must remember, also, to pray for the souls of those who are searching for the truth. Pray for our children, that God will provide them with mates who will help them get to heaven. Pray that God will open a door for us to reach more lost souls with the gospel. Paul wrote in Romans 12:2: “And do not be conformed to this world, but be transformed by the renewing of your mind.” Relevance urges us to conform. Divine revelation tells us to be transformed. Truth or relevance? We must teach our children to make the right choice. 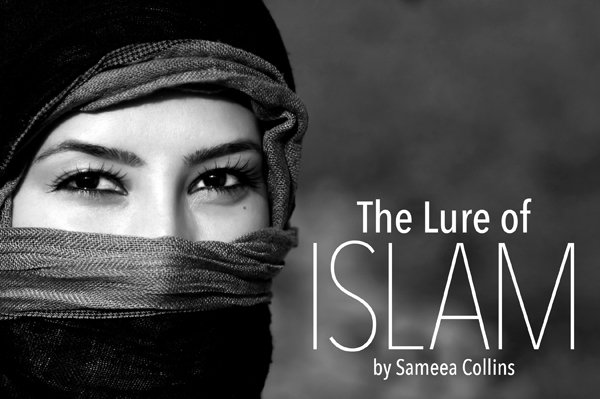 Sameea Collins is a minister’s wife and the mother of two. Her family worships with the Central Church of Christ in Dalton, Ga., where her husband, Bryan, preaches. She also works closely with the women of Pakistan through a program called WINGS (Women in God’s Service) under the direction of the Woodstock Church of Christ. For more information on this work, contact her at csameea1993@gmail.com.